JUST reprinted! 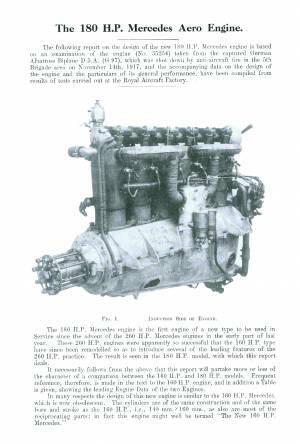 Ministry of Munitions March 1918-published report on a captured 180-hp Mercedes aero engine! This 20 page facsimile is a complete version of the original report with seven detail sketches of components, a sectioned side view and five photos of Albatros D.4545/17,as well as both sides of the motor. Perfect contemporary data for detailing miniature model engines. These powerplants were used in the most numerous Fokker, Albatros and Pfalz fighters of WWI!